1) The filing date of the tax return establishing the debt must be at least two years old. The tax returns which established the tax debt must have been filed more than two years before the bankruptcy petition is submitted. An IRS Substitute for Return will not satisfy this requirement. 2) The due date for filing the tax return must predate the bankruptcy petition by at least three years. The tax returns must have been due three years or more before the bankruptcy petition is filed. The tax return due date on which the bankruptcy petition is based must include all valid extensions. 3) The tax debt assessment must be at least 240 days old. The income tax debt identified in the bankruptcy petition must have been assessed by the IRS at least 240 days before the petition is filed. The tax liability must have been entered on the taxing authority’s records. This time limit may be modified if the IRS suspended collection activity because of an Offer in Compromise petition or a previous bankruptcy filing. 4) Bankruptcy petitioners must provide copies of previous tax returns. The bankruptcy petitioner is required to prove that the four previous tax returns have been filed with the IRS. The four previous tax returns must have been filed no later than the date of the first creditors’ meeting in the bankruptcy proceedings. The tax returns must be provided to creditors when requested. 6) The taxes identified by the bankruptcy petition must be income taxes. Taxes such as payroll taxes or fraud penalties can never be eliminated by a bankruptcy petition. 7) The tax return is truthful. The taxpayer filing the bankruptcy petition must not have committed fraud or willfully evaded paying taxes. A Chapter 7 bankruptcy discharges the taxpayer’s obligation to pay non-priority tax debt. A Chapter 7 bankruptcy prevents the IRS from seizing a taxpayer’s bank account or wages. A Chapter 7 bankruptcy does not allow for the discharge of priority tax debt or the payment of such debt over. 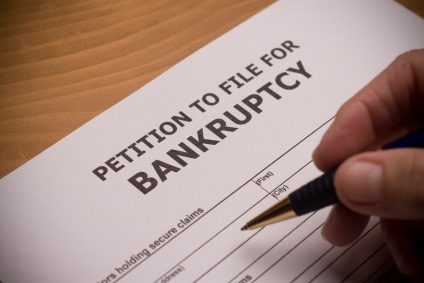 A Chapter 7 bankruptcy can apply to state and local tax debt as well as IRS tax debt. Chapter 13: provides for the partial discharge of non-priority tax debt. A Chapter 13 bankruptcy petition lumps non-priority tax debt with other unsecured debt. Although a Chapter 13 bankruptcy does not fully discharge non-priority tax debt, it will likely allow the taxpayer to pay a percentage of the total unsecured debt through the life of the plan which could last either three or five years. A Chapter 13 bankruptcy can apply to state and local tax debt as well as IRS tax debt. If the IRS recorded a tax lien prior to the filing of a bankruptcy petition, the lien will remain. The lien must be paid form profits once the property is sold even if the tax debt has been discharged. Secured tax debt must be paid in full. The collection period continues until the collection time limit expires or the tax debt is cleared. In a Chapter 7 bankruptcy, property taxes are non-dischargeable if they were incurred before the bankruptcy petition was filed. In a Chapter 13 bankruptcy, property taxes that were payable (without penalty) more than one year prior to the bankruptcy filing can be discharged. Taxes such as FICA, Medicare and income taxes that an employer withholds from employees must be repaid. Sales taxes paid by the debtor’s customers must be repaid. These certain taxes include employment taxes, excise taxes, and custom duties. These taxes must be repaid if the transaction or event that sparked the penalty occurred less than three years prior to the filing of the bankruptcy petition. If you have an unresolved tax debt, our experienced Certified Public Accountants and Enrolled Agents can help you resolve it. To schedule a free and comprehensive consultation with an licensed tax professional (no salespeople here! ), simply call us at 877-889-6527 or submit our online consultation request form.